In October 2014 the Miracle Mile Residential Association [MMRA] commissioned a “Neighborhood Traffic Mitigation Plan” of the Miracle Mile. The MMRA selected Gibson Transportation Consulting, Inc. to prepare a comprehensive study of the area with special focus on 8th Street between La Brea Avenue and Fairfax Avenue. The study includes collecting traffic counts, reviewing accident reports, and making recommendations for traffic controls. The MMRA’s principal objective for this traffic plan is to improve the safety of our streets for pedestrians, motorists, and cyclists alike. Short of barricading the entire Miracle Mile, there is very little that can be done to reduce the overall volume of traffic. The implementation of the Wilshire Bus Rapid Transit curb lanes on Wilshire Boulevard and impending subway construction will only add to the number of vehicles coursing through our residential streets – a situation already exacerbated by Waze and other way-finding apps that send motorists shortcutting through the Miracle Mile. MMRA President James O’Sullivan and Vice President Ken Hixon met with Patrick Gibson, President of Gibson Transportation Consulting, Inc., and Ben Seinfeld, Field Deputy for Council District 4 Councilmember Tom LaBonge, to review preliminary results of the traffic study on April 1, 2015. The MMRA is pleased with Gibson’s thoroughness and professionalism. The study is a work in progress and the initial research answers some questions and raises others. Of course, devising improvements is one thing – financing the cost of their implementation is a much more difficult challenge that will have to be addressed by the community at a later date. Gibson is continuing their work on the study and once the final Neighborhood Traffic Mitigation Plan is completed it will be shared with the entire community. Installation of stop signs and/or traffic signals is governed by standards dictated by the State of California. Traffic counts along 8th Street are not sufficient to meet state requirements for the installation of additional stop signs or lights between La Brea Avenue and Fairfax Avenue. Continental crosswalks – broad “Zebra stripe” crosswalks – have been proven to reduce injuries and deaths by making pedestrians more visible to motorists. Gibson recommends that continental crosswalks be added to every 4-way stop and traffic signaled intersection along 8th Street. Cochran Avenue and 8th Street is a priority as this intersection is used by children attending Cathedral Chapel School. The pedestrian signals at this location need to be updated to modern “count-down” models, as well. North/south streets between La Brea Avenue and Fairfax Avenue intersect 8th Street at an acute angle that can make it difficult to see cross traffic and ascertain whether it is safe to cross or turn onto 8th Street. This “line of sight” problem is a historic source of accidents. Gibson surveyed every intersection along 8th Street and observed that overgrown foliage on some corner lots obstruct the field of vision for motorists and cyclists. Gibson is preparing an inventory of these properties with foliage that exceeds code limits for corner lots. 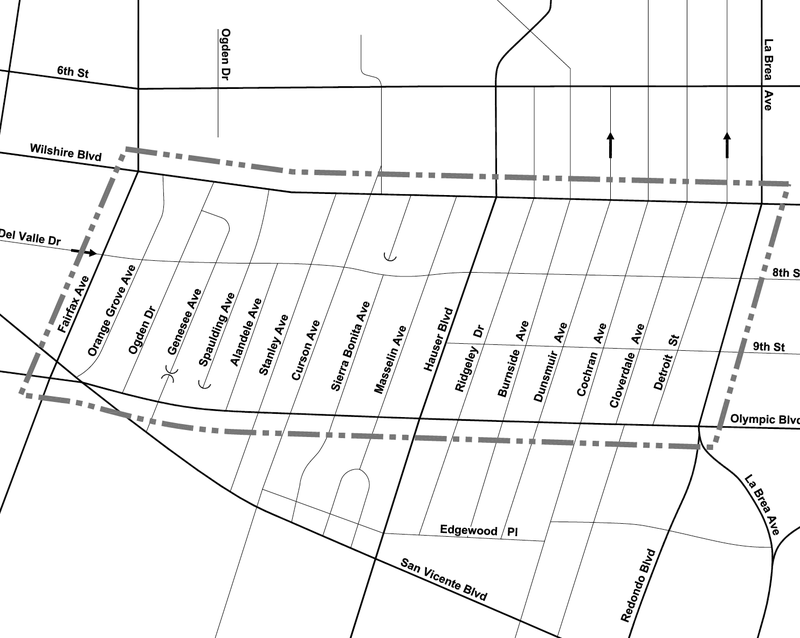 Gibson’s investigation revealed that the intersection of Masselin Avenue and 8th Street does not conform to minimum standards for adequate line of sight. Northbound vehicles on Masselin Avenue must pull well out onto 8th Street to check for oncoming cross traffic, making it dangerous to cross 8th Street or to make a left turn [see Gibson charts linked below]. Removing three-to-five parking spots on the south side of 8th Street just east of Masselin Avenue would improve line of sight, but restricting northbound traffic on Masselin Avenue to right turns only at 8th Street might be a better solution. Gibson is analyzing both options. The Los Angeles Police Department only takes reports of accidents that involve personal injury. This skews the official accident tally by not including the majority of accidents: Those that do not result in physical injury to motorists. A review of LAPD accident reports indicates the risks of crossing or making left turns onto Olympic Boulevard, particularly during “peak hours” (morning and afternoon rush hour periods). Restricting traffic on north/south streets intersecting with Olympic Boulevard to right turns only during peak hours would lower the number of collisions. Gibson is studying which Olympic Boulevard intersections this mitigation might be called for. Construction of major “infill” apartment developments on the former surface parking lots behind the Desmond’s and Dominguez-Wilshire buildings, as well as the closing of the public parking lots on Detroit Street (north of Wilshire Boulevard) for use as subway construction yards, have created a severe parking shortage at the eastern end of the Miracle Mile. Parking at the western end of the Miracle Mile is strained by visitors to Museum Row, new apartment and condo developments, and by older multi-unit buildings with little or no off-street parking. This parking crisis will be worsened with the commencement of major subway construction along Wilshire Boulevard, which will eliminate some parking spaces near the subway construction sites. The MMRA is collaborating with Metro, the Los Angeles Department of Transportation, and Council District 4 to explore adding diagonal parking to streets between 8th Street and Wilshire Boulevard. Gibson is preparing studies on how many new parking spaces would be gained and what impact it would have on traffic patterns. Gibson recommended that those streets in Miracle Mile without Preferential Parking seek that status and those with Preferential Parking petition the City for 24-hour/seven-days-a-week permit parking only. The MMRA strongly endorses this recommendation and has been encouraging the residents to take action for the last year or so. The MMRA has created a “Preferential Parking Primer” on its website to aid residents seeking Preferential Parking for their block and for those who desire to change their respective permit parking restrictions. This entry was posted in News and tagged 8th Street, Ben Seinfeld, Fairfax Avenue, Gibson Transportation Consulting, James O'Sullivan, La Brea Avenue, LADOT, Los Angeles Department of Transportation, miracle mile, Miracle Mile Residential Association, mmra, Patrick Gibson, Purple Line Subway Extension, subway construction, Tom Labonge, traffic, traffic mitigation, traffic plan, Wilshire Bus Rapid Transit. Bookmark the permalink.